This article is about the planes of Oblivion. For the gates used to enter the planes, see Oblivion Gates. As you play through Oblivion, you will travel through the Planes of Oblivion multiple times. Many of these oblivion worlds are associated with the main quest. There are also a small number of additional oblivion worlds that you can enter on Daedric Quests. All of these Oblivion worlds have a generally similar appearance. They are all fiery and sunless (which can be a relief for Vampires, for they do not have to worry about Sun Damage while in Oblivion), with large lava fields. The flora, fauna, and landscape are all dangerous, with many unpleasant traps. As described in the lore entry on Planes of Oblivion, the plane of each Daedric Prince is supposedly very different in appearance. 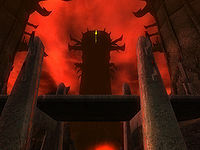 It is therefore surprising that the Oblivion worlds entered during the game are all so similar, given that they belong to at least three different princes (Boethia, Mehrunes Dagon, and Peryite). In most Oblivion worlds (except for those associated with Daedric quests), there is a central tower that is your objective. At the top of that tower is a room containing a Sigil Stone; once you remove that stone, the Oblivion gate will be closed, and you will be transported back to Tamriel. You can only close one gate for each Sigil Stone collected, and so for worlds with two gates the gate which closes is the most recent gate you've entered. After that, the remainder of the two gates will still be open and will open to a new world when you go through it. Sometimes, this glitches out and will tell you "This door leads nowhere." if you try to go through the other gate. This is either the cause of the other gate already being closed, or your world not having the requirements of spawning another gate, because all available gates have been spawned already and the maximum number of random Oblivion gates has been reached. Inscription in Oblivion: the text transliterates as "Here is no There is no"
There are several plants that only grow in Oblivion or in the immediate vicinity of the Tamriel side of Oblivion gates and provide ingredients that do not grow natively in Tamriel: Bloodgrass, Harrada Root, and Spiddal Stick. Bloodgrass is harmless, but the other two plants are not. Various Harrada Root plant varieties will lash out to anyone close enough, causing physical damage. Spiddal sticks (except dead plants) will release a green cloud of Drain Speed poison gas when approached too closely. There are a fair number of traps that are specific to Oblivion. Outside, in addition to the aggressive vegetation, one will find land mines and towers that shoot fireballs. These are all described in more detail at Traps. In addition, those who visit an Oblivion world will encounter many more familiar traps: rock falls, guillotines, dart traps, etc. Any such adventurer should always be careful of the many ways to immolate oneself in Oblivion: falling into the lava will result in rapid death (even with Resist Fire enchantments), and there are also many bonfires that are easy to accidentally back into when fighting the numerous local creatures. In short, it is advised to tread carefully in the Planes of Oblivion, as the whole landscape is a deathtrap. The Planes of Oblivion are not very rich in loot, however, a small amount does exist. Instead of chests, one should look for Fleshy Pods, either hanging from rocks or sitting on the ground, and The Punished which are only found inside towers. Some corpses hanging from the ceiling or sprawled on rocks might have some gold on them. The inhabitants of Oblivion are Daedra and Dremora. Most Daedra drop unique ingredients that are hard to find elsewhere. One can loot the corpses of Dremora for weapons and various other items, but their armor cannot be taken (except from Valkynaz). This may be a blessing in disguise, since the Dremora weapons are already so heavy that trying to bring all the weapons back from a trip to Oblivion can be very challenging. There are a few beneficial items in Oblivion. In particular, Blood Fountains restore health and Magicka Essences restore magicka. The majority of these are found in towers but you can come across one or two in the exterior. You will emerge from the Oblivion Gate into a typical Oblivion landscape. 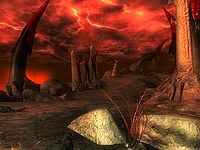 The name of the landscape will vary: in random worlds you will find yourself in the Wastes of Oblivion; in most quest worlds you will be in the Plane of Oblivion, except for The Wayward Knight, which is in the Realm of Oblivion; on the Daedric quests, you will be in the Realm of Boethia and Realm of Peryite, respectively. With the exception of the Daedric quests, there is no apparent significance to the different names given to the landscape. Other than for the Daedric quests, your objective is always to locate and enter the main tower. Although you may be able to immediately see the tower, it is not possible to just walk straight towards it. In some worlds, you will have to work your way through a maze of lava fields, cliffs, and/or rockslides; Acrobatics and Athletics skills can be an advantage. Sometimes you will have to go through a set of caves to make it past an obstacle. Or you may need to enter a peripheral tower, for example to activate the switch that opens a war gate, or to gain access to a bridge. 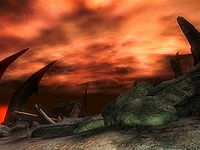 On your way you will have to contend with level-dependent Daedra and Dremora. Creatures aren't the only thing to worry about, since the entire place (even the vegetation) wants you dead. Watch out for a large variety of different booby traps and fire towers. If you are not trying to get through the world as quickly as possible, it can be worth while to explore the surface more fully. In particular, the Fleshy Pods containing loot are often located off of the main route from gate to tower; peripheral towers or cave systems may contain The Punished, with better quality loot. Also, you can greatly increase the number of rare Oblivion ingredients that you collect with a bit of extra exploration. 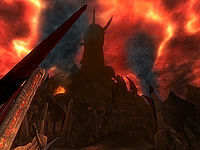 However, you will also end up triggering more booby traps and fighting off additional Daedra and dremora. Caves can occasionally be found in Oblivion Worlds. Sometimes the cave is small, and will only lead you to some bonus loot (or none at all). There are also series of caves that are part of the route you need to take to reach the Sigil Keep. These series of caves are actually randomly picked from a list of possible Random Oblivion Caves (similar to how Oblivion Worlds are randomly picked). These series of caves are always labeled as Nether Tunnels from the outside. Every Random Oblivion World contains a tower that serves as the citadel of that world, the Sigil Keep. 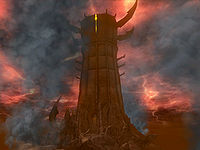 This means that you eventually have to visit this tower in order to close the Oblivion Gate you have entered. This tower contains the Sigil Stone that keeps the Oblivion Gate open. The Sigil Keep is generally the largest of the towers; it can often be recognized by the yellow light emanating from the Sigillum Sanguis at the top of the tower. The basic layout for this type of tower consists of a tall open base that leads almost to the top. There is no direct route that leads to the top; instead, you have to pass through various hallways that circle around the base of the tower to reach the top. At the top there are always two doors leading to the Sigillum Sanguis at the top of the tower. The base of the tower consists of a tall spire. Apart from the ground floor, there are various platforms attached to the walls. In the middle you can find a pool of lava with a fire pillar leading upwards (to the Sigillum Sanguis). Coming into contact with the pillar or the pool of lava results in an instant death for every actor coming into contact with it. The map of this zone can be confusing, because it will show a good number of doors, even though when you look around you only see two or three doors. The map is showing all the different vertical levels of the tower superimposed on one another in a single map. Each ring on the map represents a different vertical level, with its own entrances and exits. It is generally easiest in the main hall to ignore the map because it does not provide you any information on how to ascend. The number of additional hallways in the tower vary between 1 and 3. They are usually named Rending Halls or Corridors of Dark Salvation (and less commonly Dead Halls or Desolations End). The hallways usually consist of corridors leading you upwards, suggesting you are climbing the tower by spiraling upwards via the outer sections of the tower, though this is contradicted by corridors that appear to pass straight through the middle of the tower. But then, remember that you are not in the mortal realm. 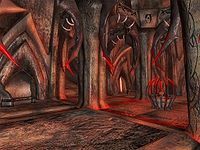 The hallways are home to a number of Daedra enemies, as well as some traps. The enemies are usually located in the rooms that connect the various corridors. However, this is not always the case; sometimes Dremora will attack you while you are on the spiraling pathways in the middle of the tower, ascending toward the Sigilum Sanguis. They will often summon Daedra to assist them. This room is your ultimate destination in Oblivion worlds, because this is where you will find the Sigil Stone that serves as the anchor for the Oblivion Gate to Tamriel. The Sigillum Sanguis is always located at the top of the Sigil Keep. The Sigillum Sanguis is the uppermost room in the main tower. The Sigil Stone that is controlling the Oblivion Gate can be found in the room. Removing the stone will cause the gate to permanently close, after which you are automatically transported back to Tamriel, to where you entered the gate. Before grabbing the Sigil Stone, you probably want to check The Punished near it, which contain boss-level loot. The Sigil Stone itself is found at the very top of the room, inside of the bright column of flames seen throughout the tower. Be careful not to come into contact with the pillar of fire as it will instantly kill you. Once you take the Sigil Stone the tower will catch fire and will start falling apart around you. After several seconds you'll be returned to Tamriel. If you walk off of the platform where the Sigil Stone was obtained, it instantly teleports you out. The words sigillum and sanguis are Latin, meaning "signet, seal, figurine" and "blood" respectively. As used in Oblivion, they do not form a grammatically coherent Latin phrase. A correct alternative would be sigillum sanguinis (with "blood" in the genitive case), which would mean "seal of blood". Portals of Natural Disaster, found in Random Oblivion World 2. The Brooding Fortress, found in Random Oblivion World 4. The Blood Feast, found in the Kvatch Oblivion World. The Fury Spike, found in the Bruma Oblivion World. The Chaos Stronghold, found in the Cheydinhal Oblivion World. World Breaker, found in the Great Gate Oblivion World. The outside is that of a generic Sigil Keep. Its interior differs per visit. Random towers are a set of Sigil Keeps from which one is selected randomly when entering a Sigil Keep from Oblivion Worlds 1, 3, 5, 6 and 7. The specific tower is only selected (randomly) when you first enter the Tower Portal door. After that the door will always lead to the selected tower. These Oblivion Worlds are quest-related, and are always accessed by one specific Oblivion Gate. This world is accessed by the first gate that opens outside Bruma during the Bruma Gate quest. This is accessed by the gate that opens outside Cheydinhal during the main quest, and is part of The Wayward Knight quest. 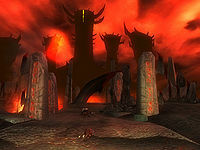 This world is entered during the Great Gate quest in the Main Quest. This is the first Oblivion world you will encounter, during the Breaking the Siege of Kvatch quest. 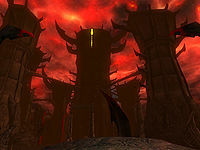 You will enter Boethia's Realm during Boethia's Daedric quest. 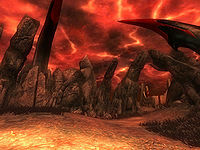 You will enter Peryite's Realm during Peryite's Daedric quest. Most Oblivion gates access one of the following seven random worlds. (Because two of the worlds have two possible entrances, it can appear as if there are nine worlds). The 90 Random Gates will connect to any of these seven; several of the city gates will connect to one specific random world. If there is a fairly open area in front of you, with a war gate between you and the Sigil Keep (with another tower visible on either side of it), you are in World 1. If you are standing on a broken bridge section, with five towers and a dead horse visible in front of you, you are in World 3. 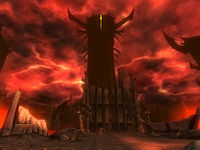 If you can see a tower to the southeast, with two charred corpses at the base of the gate behind you, you are in World 5 at the northwest entrance. If you can see two towers to the west (requires climbing on top of some rocks), you are in World 6, at the northeast entrance. If you are standing in front of a large rock, with seven towers visible in front of you (some may be hidden behind others), you are in World 2. If you see three towers in front of you, with a road leading away from you and passing under a bridge, you are in World 4. If the only tower is visible to the west (more clearly visible if you step forward), you are in World 6, at the southeast entrance. If in front of you the path curves up a hill, with a tower half-hidden by smoke on top of the hill, you are in World 7. If you can clearly see a tower to the northwest, and two charred corpses in front of you, you are in World 5 at the east entrance. 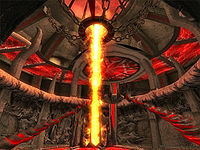 The game will only have one Tamriel gate connected at a time to each of the nine possible gates on the Oblivion side. So if you already have gates open to a couple Random Oblivion Worlds (and have not yet retrieved their Sigil Stones and closed the gates), any new gate you open will not reconnect to one of the same places. If you keep opening gates and returning without closing the gates the game will eventually (after nine gates) be forced to recycle and will reset the previously opened gates (i.e., you lose any progress you made and will lose any equipment you left there). Also, when opening a new gate, the world it connects to will never be the world of the last gate you closed, e.g. if you are planning on farming gates for World 2 to get multiple copies of the Hatred equipment, you will only be able to do this for every second gate. Worlds 5 and 6 each have two entrances. If you find the other entrance, you could return to Tamriel through it as long as you have not yet reached the maximum number of opened gates at that point in the game. Typically the other entrance will randomly teleport you to a new location in Tamriel. It is possible to emerge at a gate that was not previously marked on your map. 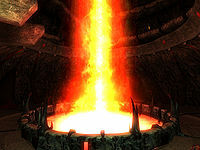 If, however, you have been entering oblivion worlds and not closing the gates, it is possible that the other gate is already connected to a specific location in Tamriel, i.e., to the location at which you previously entered this world. When you remove the sigil stone in one of these two-gate worlds, you will be returned to the site of whichever gate you most recently used, and only that one gate is closed. If you return to the other gate and re-enter it, you will be transported to a new random world instead. Within the random Oblivion worlds, there are additional elements that are randomly determined. In most of these worlds, the name and inside layout of the Sigil Keep is random. Cave systems may also be randomly determined. These elements can be random even in the city gates that always connect to a specific world. You will exit this gate facing north. A path leads away from you to a war gate, with three towers visible past the war gate; a fourth leaning tower can be seen to the west. The Bravil gate always connects to this world. The Sigil Keep of this world is randomly chosen. You will exit this gate facing south, with a large rock right in front of you. On the opposite side of the rock, you will see multiple towers (there are seven in all, but some may be hidden behind others). The Chorrol gate always connects to this world. The Sigil Keep in this world is always the Portals of Natural Disaster. The Hatreds Soul bow and arrows, and Hatreds Heart mace, are found here. You will exit this gate facing north. A broken bridge bearing a dead horse leads away from you towards five towers. The Leyawiin gate always connects to this world. You will exit this gate facing south. A road leads away from you, immediately going under a bridge that joins two towers. A third tower is on the other side of the bridge. The Skingrad gate always connects to this world. The Sigil Keep in this world is always The Brooding Fortress. This world can be entered at either of two entrances. E: You will exit this gate facing southwest. A medium-sized rock with a couple of tufts of bloodgrass is right in front of you; two charred corpses lie on the ground in front of you; a tower is visible to the northwest. NW: You will exit this gate facing east, with a tower visible to the southeast; there are two charred corpses at the base of the gate, behind you. Finding this entrance in the construction set is difficult; it is located in an anonymous "Wilderness" cell at coordinates (15,19). SE: You will exit this gate facing south. There is a smoky pyre to the southwest, but no immediately visible towers. If you step forward, you can see one tower to the west. NE: You will exit this gate facing east, with no immediately visible landmarks. If you jump up on the rocks behind the gate, you can see two towers to the west. This world contains the unique Blood Potion. You will exit this gate facing southwest with a path curving away up the hill in front of you. At the top of the hill (semi-obscured behind columns of smoke) you can see one tower; another tower is partially visible to the southeast. The Anvil gate always connects to this world. * The quantity can only give an idea of the amount that can be found of this container. Due to the randomness in visiting the Planes of Oblivion, you can encounter some containers far more often than others. This page was last modified on 5 November 2018, at 00:23.